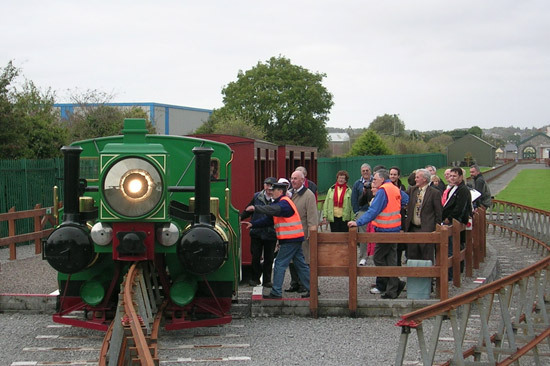 The Listowel-Ballybunion Railway opened on 1st March 1888. 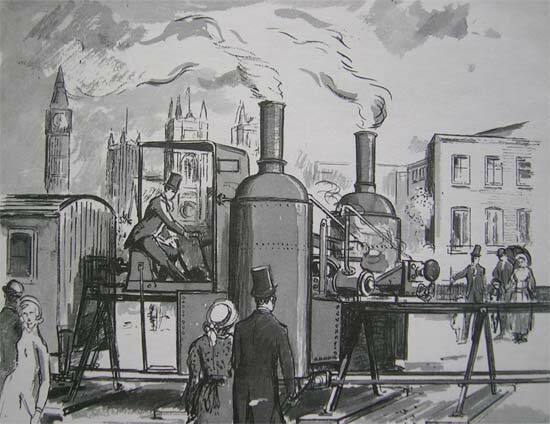 It ran the ten miles between the two towns and was remarkable as the only railway of its type in the world. How two small towns in the south west of Ireland came to be linked by the world's first commercial passenger-carrying monorail is a fascinating story. The monorail employed on the Listowel-Ballybunion line was invented and developed by a French Engineer named Charles Lartigue, hence the name Lartigue Monorailway by which the line was best known. Lartigue had built a prototype monorail in Algeria; it was about 90Km in length and was used to carry esparto grass across the desert. The cargo was carried in pannier-like wagons slung on either side of a single rail, which was itself mounted on A-shaped trestles. The wagons were connected to bogies whose wheels ran along the rail. Lartigue is reputed to have got the inspiration for this design from watching camels serenely carrying large loads in panniers balanced either side of their backs. There is no doubt that the single raised rail was a distinct advantage in the desert where shifting sands would have made a conventional rail line virtually unusable. — The original Lartigue Monorail on one of its lengthy journeys. In 1886 Lartigue brought a length of his line to an exhibition in London, in the hope of selling his idea as a viable railway option. Coincidentally, at this time the populace of North Kerry were lobbying for the railway system to be extended to include a link between Listowel and Ballybunion. This request was at that time lying on a minister's desk in Westminster; the rest, as they say, is history. 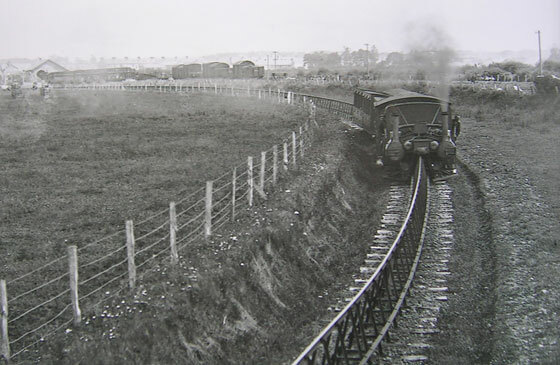 It was decided that the Lartigue idea would be tried out on the Listowel-Ballybunion Railway. The Listowel-Ballybunion Railway was opened in 1888 at a cost of £30,000 and it ran for 36 years until it was closed in 1924. The train carried passengers, freight, cattle and sand from the Ballybunion sand-hills. Among the passengers were Ballybunion school children going to the Listowel Secondary Schools, Kerry and Limerick people making their way to the beach resort of Ballybunion and golfers going to the fledgling golf course at Ballybunion, which was to develop into one of the greatest golf courses in the world. The line was only barely financially viable for the whole of its existence; it is reputed never to have made a profit. The closure was hastened by the severe damage that was inflicted on the line during the civil war of 1921-23. The railway has about 1000 metres of monorail track, three switches, two turntables and three platforms representing Listowel, Lisselton and Ballybunion. There is one engine, which is an exact reproduction of the original engines, save that the present engine (62 Loco No. 4 0-2-0) is diesel driven. There are two third class carriages, modeled as closely as possible on the originals, using photographs and the memory of those who traveled in them. 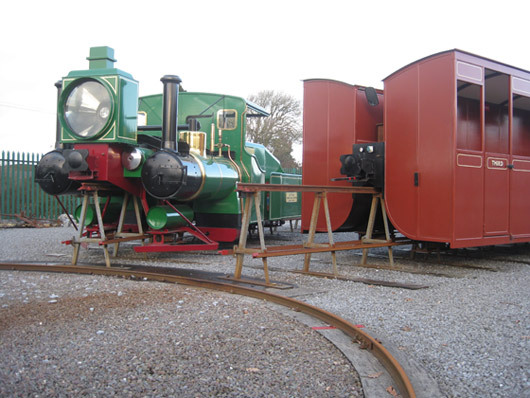 The engine, carriages, switches, turntables and the track A-frames were built by Alan Keef Ltd of Ross on Wye in Monmoth. Alan Keef are the builders of many theme railways in Britain and round the world and they surpassed themselves on this occasion in producing these stunning Lartigue replicas. The final touch of authenticity is the site itself. The present journey on the Lartigue starts less than 100m from the point where the original Lartigue commenced its journey to Ballybunion. The site of the original Lartigue Listowel Terminal is preserved in a park adjacent to the new Lartigue, the bases of two switches are preserved as well as the foundations of the Engine House. Lartigue President Jack McKenna most generously presented this park to the Lartigue Company.